Hello, the Connoisseur of Conjuring worldwide! 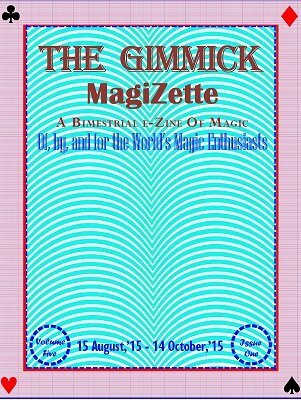 Back again, with the first issue of new volume of The Gimmick MagiZette - India's pioneer and premier e-zine - A bagful of smorgasbords magic and related matters. Surely some of you would comment that I am late by (a long sound slumber of) four months - true, read the index of the current issue of TGM and you would agree that late, but this issue is just GREAT! As if the other issues were not the similar. Lend An Ear ... Interesting lines.